The Jeep Wrangler carries a history dating back to WWII when Willys Jeeps hauled soldiers on and off the battlefield. Modern-day Jeep enthusiasts have such a connection to that heritage that Jeep even has a Willy's Wheeler Wrangler edition. The current 2017 Jeep Wrangler Unlimited embraces the rugged heritage of the past while also blending it with comfort, utility and modern technology. Its family-friendly four-door model allows the driver to include four additional passengers on his/her adventure through all kinds of terrain. A 3.6-liter V6 engine is standard on all Wrangler Unlimited models, pushing power to all four wheels and generating 285 horsepower and 260-lb-ft of torque. A six-speed manual transmission equipped with hill start assist and high and low range gearing is also standard. Towing capacity for the Wrangler Unlimited is at 3,500 pounds when properly equipped. Furthermore, the Wrangler Unlimited can handle the most extreme terrain due to its 42.2 approach angle, 25.8 breakover angle, and its 32.3 departure angle. In the off-roading arena, the Rubicon trim takes the lead. It is geared up with a Dana 44 heavy-duty solid front axle, a Rock-Trac transfer case with a 4:1 low-range ratio, electronic locking differentials, rock rails, winch-capable steel bumpers, and Mud-Terrain tires. As mentioned earlier, the Jeep Wrangler Unlimited holds true to its past, and it keeps signature features such as removable doors, removable tops, exposed hinges, classic round headlights, a fold-down windshield, and half-doors. 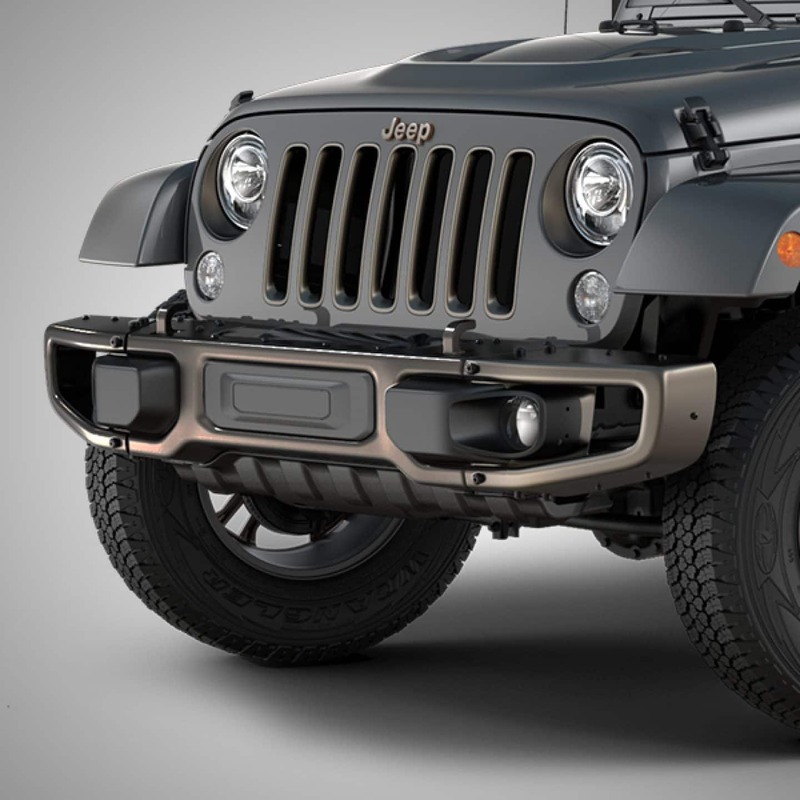 There are four major trims in the Wrangler Unlimited lineup, Sport, Sport S, Sahara and Rubicon, with various sub trims and specialty models added to the lineup. The Sport trim comes standard with foglamps, halogen headlamps, 16-inch on/off-road tires, tow hooks, A/C, a folding soft top, an eight-speaker audio system, and more. The Sport S adds 17-inch tires and allows the addition of the Power Convenience Group, which includes power doors/windows/locks, power heated mirrors, keyless entry, an auto-dimming mirror with reading lamp, and a security alarm. The Sahara adds LED foglamps, automatic/LED headlamps, silver grille inserts, 18-inch wheels, power heated mirrors, side steps, keyless entry, and satellite radio. The Rubicon adds the off-road upgrades mentioned above plus an electronically disconnecting front sway bar. One of the unique specialty trims available for 2017 is the 75th Anniversary Edition Wrangler Unlimited. It is inspired by the original WWII Willy MB and has unique detailing and trim that celebrates that heritage. Does the 2017 Jeep Wrangler Unlimited have two or four doors? The Wrangler Unlimited is a four-door SUV that holds five passengers. Where can I see all your new Jeep inventory? Click here to see our Jeep Inventory. Yes, click here to go to our Financing Center. The 2017 Wrangler Unlimited comes with several standard and optional safety and security features. Some of the standard features include electronic stability control, airbags, a vehicle immobilization system, electronic roll mitigation, and hill start assist. Additional features include hill-descent control, on- and off-road four-wheel disc antilock brakes and keyless entry. If you want a renowned SUV steeped in tradition, then the Jeep Wrangler Unlimited is the perfect choice. Come down and test drive one today!